When did you start speedsurfing and what was the reason to start? I started speedsurfing in 2006. Speed has always interested me, as a kid I had to go fast on my bike, on ice skates, while running… I’ve never been interested in tricks and turns. So since I started windsurfing in 2003 I have been curious for how fast I was going. When you started surfing with the GPS, a few months later I bought one too. And now I’m an addict. I have had many great speedsurfing days, but my fastest session is for sure in the top three, and it has an surprising story to it. It was last summer, somewhere in July. I was staying at the campsite in Makkum for the holidays. The predictions for that day were rubbish, something like 14 knots. So I had a few (a lot…) of beers the evening before. The next day it seemed as we were getting some thermal winds. At first I didn’t feel like going to The Brace (one of the fastest spots of NL, behind a sandbar), as I was already sweating beer… And The Brace is a mile walk through mud with equipment! Luckily some others convinced me of going. Once there, I actually felt quite good. Nice sun, and the wind was building up. I rigged my 5.0 RS Racing (I weigh 63kg, hence the size). After the walk when we arrived at the water, I felt a bit woozy. That’s probably why I was the first one sailing. The angle was superbroad, and the wind wasn’t much yet. Had to struggle to make it through the run. After a while the wind was getting more and more, and the speeds went up. I think it started with some 71 ten second runs. Some of the others were still struggling with the super broad angle, but because of my weight I didn’t have much trouble. I went through the nasty chop at the start of the run with more speed every time. At that moment I hit a great gust and some of the others saw me flying. Incredible feeling, but it didn’t even feel fast. Looking at the GPS I went crazy. Max 1 sec: 79,63 km/h. Fastest speed of the day, while at least one Dutch pro was there. Still gets me happy when I think of it. The two main points I went fast this day: the super broad angle and my state of mind… I wasn’t expecting anything because of my hangover. 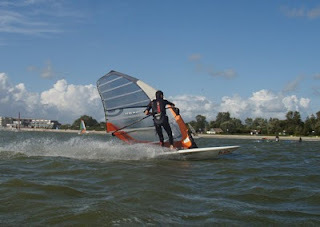 I would like to see a really affordable freeride kit for starting windsurfers. I think the big price tag of the sport is one of the reasons it isn’t more popular. Also a good solution for transporting the material, maybe something like boards consisting of two parts (only for recreational use off course). For speedsurfing a fin with rake adjustable on the go… But I’m giving away to many good ideas right now ;). Yes, I have more! I’m not really a distance guy, I don’t like to sail big and have a very active style. I usually call it a day below 100km’s. I do really like Alpha racing and the nautical mile though. We do have the team (and the spots) to shake up the ranking quite a bit. The RS Racing 4.6 and 5.0 are my favorite sizes. Both have a very locked, calm feeling for such a small sail. The 5.0 is more of a powerhouse, the 4.6 has no wind limit and has proven itself in 51 knots at La Franqui, with so much ease! The Missile XS is the board for both sails. Very efficient for me. The Caspar 23 fin gives a super safe feeling. The confidence of going with 70+ into chop without spinning out or losing control. I’m now looking for even smaller fins. Do you think your weight of 63 kilo’s gives you a disadvantage? Easy question: yes. The tighter the angle, the more chop, the more constant the wind, the bigger the difference. Free choice of angle and the difference gets smaller. But, there is still (a lot) of speed to gain for me, with my current weight. I’m nowhere near as good technically as some of the pro’s and with tuning I’m sometimes a bit lazy. With the right support, material, mindset and conditions I’m sure I can sail 77 km/h average. And weight will come in some years hopefully. Where are you going to focus on to get faster? Tuning needs more attention. I need to try more fins, vary sail trims, harness line length, adjust some of my equipment and try different set ups in board/sail/fin combinations. I’m always trying different stances. I’ve found a overall stance that works for me but I keep trying different things. I’ve also noticed that mindset is super important. While sailing my highest speed I was so laid back, I didn’t have any expectations. It works! When I was your age, I just owned 64 kg! Nowadays I gained 30 kg without gaining length! Just weight a couple of years, enjoy your life, eat kabab at la franqui and sometimes a beer. Speed and lbs will join you gradually!